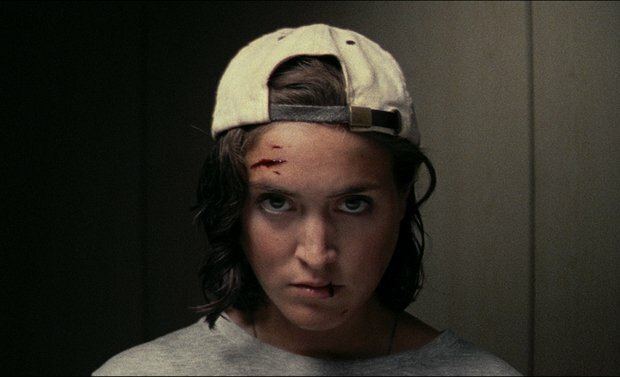 Shot on grainy 16mm and accompanied by a throbbing synth score, the first feature from German writer-director Tilman Singer opens with a long shot: a disorientated young woman in a backwards baseball cap – the titular taxi driver Luz (Luana Velis) – walks through police station doors, drops coins into a vending machine, and asks the receptionist, 'Is this how you wanna live your life?' This question recurs throughout Luz, as do various images, moments, and words as scenes appear as individual puzzle pieces to be assembled by the audience. Singer's storytelling is in the startling visuals rather than the slender, peculiar plot. We watch a woman, Nora, (Julia Riedler) meet a psychologist (Jan Bluthardt) in a bar as she loads him up on booze and drugs. She tells him about a friend from her Catholic girls' school past called Luz, and the strange goings on that she witnessed there, before they head into a bathroom where a supernatural body exchange happens. Afterwards (or is it before? ), the same psychologist takes part in a police interrogation, hypnotising the girl in a backwards baseball cap, while a detective (Nadja Stübiger) supervises. Under their watch, Luz re-enacts an exchange in her cab which involved her old schoolmate, Nora. Eventually all hell – and a demonic possession – breaks loose. Initially made as a film studies project, Luz combines experimental filmmaking with horror genre tropes – its closest relation is Jonathan Glazer's Under the Skin, although it lacks that film's humanity. Instead, Singer's effort is ice cold. Shots are composed like still-life paintings, while slow zooms bring us quietly into and out of the drama. Violent moments arise, although Singer seems to be above overt scares. At times frustrating and throughout bewildering, Luz is nevertheless a restrained, hypnotic jigsaw of a film and a thoroughly distinctive debut. Screening on Wed 27 and Thu 28 Feb as part of the Glasgow Film Festival 2019. General release TBC. Luz (Velis) is a taxi driver whose life is mixed up with former schoolfriend Nora (Riedler), who is talking with a psychologist (Bluthardt). A combination of experimental filmmaking with horror genre tropes, at times frustrating and throughout bewildering, but thoroughly distinctive.